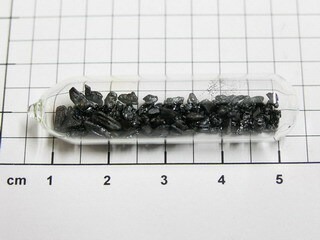 Iodine comes as black, shiny crystals that dissolve in alcohol; the result was sold as an antiseptic solution. 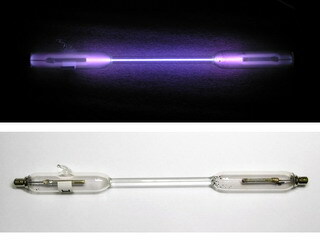 Iodine salts (iodides) are used in dyes and photography, as industrial catalysts and in the manufacture of pharmaceuticals. 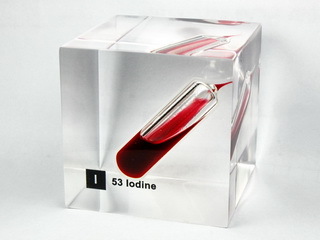 Iodine is also an essential element for humans, who require a daily intake of iodine (as iodide) of about one tenth of a milligram. Our bodies contain up to 20 milligrams, mainly in the thyroid gland. Normally we get enough from the food we eat, but people eating food grown in areas where the soil lacks iodides can develop a swollen thyroid known as goitre. Amount: 1 Stk/ 1 pc.